Easter, to Christians, should be the most important celebration of the year. 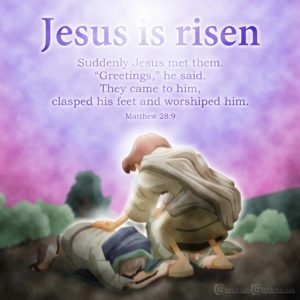 After all, Easter reminds us of what Jesus did and how He rose from the dead. It reminds us that God fulfilled His promises and sent a savior. Sometimes we go through the motions and forget why Easter is so significant. This lesson should help little ones understand the basics of God’s plan and prophetic conclusions, in order to help them appreciate the holiday beyond eggs and chocolate bunnies. Lesson focus: Jesus died to take on our sins; His resurrection completed what God had intended from the beginning. Bonus Easter Materials: Our website has over 50 Easter resources & activities for children. Here are a few we recommend if you need to extend this lesson. Game: are you alive? Have students line up on one end of a field, with one chosen participant standing or sitting at the other end of the field, with back to the others. Students quietly walk towards the “sleeper”, whispering or saying “are you alive?” At a chosen moment, the “it” will come to life and chase the others, trying to tag them before they run back to their side. If tagged, they join “it” in the chase. Otherwise, continue creeping toward “it”. Taking on sins… have students sit in a circle, and hand each one a stack of post-it notes. Ask them to write down on the notes things that would be considered bad or sinful. As they write, have them place the post-its on themselves. Explain that we deserve punishments for the bad things we do. In the Old Testament, people had to select an animal to kill in place of their evil doings. Have the kids put their post-its on a stuffed animal. Should we destroy this animal to take care of our sins? Well, that seems strange…instead, take the post-its on yourself. Watch student reactions as you “wear” their transgression post-it notes. Explain that this was why Jesus came. And His death was not a random event. God had in mind all along how He would save people. Show students a gift package, or a gift bag with a tag that says “do not open until Easter.” Ask them what they would think about getting a Christmas present that could not be opened until Easter. That seems sort of a lengthy wait! Explain that today we are celebrating the story of Easter. The beautiful thing about Easter is that it is the conclusion of the story that starts at Christmas. With Advent and Christmas, we celebrate how Jesus was born. But what was He born for? Ultimately, to take on our sins and die, so that we wouldn’t have to suffer. He did nothing wrong but was punished for what we did. With His resurrection, He had victory over sin and Satan. Invite students to look at some of the details of the story. *note: for older students, you may look over some of the prophetic verses, and see how they were fulfilled in Christ. For younger kids, just mention how the things Jesus did had been predicted and talked about even before He was born. Now there was a man named Joseph, from the Jewish town of Arimathea. He was a member of the council, a good and righteous man,51 who had not consented to their decision and action; and he was looking for the kingdom of God. 52 This man went to Pilate and asked for the body of Jesus. 53 Then he took it down and wrapped it in a linen shroud and laid him in a tomb cut in stone, where no one had ever yet been laid. 54 It was the day of Preparation, and the Sabbath was beginning. 55 The women who had come with him from Galilee followed and saw the tomb and how his body was laid. 56 Then they returned and prepared spices and ointments. Even though prophets had foretold the Messiah, and Jesus Himself told people what would happen, the disciples and followers still didn’t quite expect or anticipate what they would find when they went to the grave. The three women who first encountered the empty tomb were so excited that they ran to tell the others, who didn’t even believe the story. It is significant that Peter, who had denied his Lord a few days before, was the first to inspect the tomb and marvel at what had happened. When they saw the tomb and heard the angels, Mary, Joanna and Mary finally put the pieces together, and to an extent realized what was going on. Everything prior to this event was preparation. Everything after (the rest of the New Testament) happened in order to tell the world about Jesus. He is the central point of it all. If this is true of God’s word, it should be true in our lives. Our faith rests on the resurrection. Easter is about much more than candy and egg hunting. We don’t need to look for Jesus; He has risen! He’s just as alive in our midst and in our hearts today as He was on that first Easter morning. Let us rejoice! Let’s practice sharing that good news with others. Make an empty tomb: have students use dark colors to decorate a paper plate, cut in half with an extra hole cut from the center. Provide large pom-poms or have students crunch paper into a ball to glue on as a “stone”, and attach a cross made from two popsicle sticks, as well. Include a verse caption and remind students of the beauty of the empty tomb! Creative cross: provide cardstock or paper crosses. Allow students to color and decorate with glitter or tiny tissue pieces. Close with prayer and thanks to God for sending Jesus to save us. Ask for joy in remaining to be “Easter people” and celebrating the work of Christ, and for courage in sharing God’s great love and gospel message with other people. Jesus is Risen Illustration from ChristianClipArts.net – Used by permission. The details of Easter morning are recorded in these following 5 passages in the New Testament. This does not include the several times Jesus predicted he would come back to life.